This beautiful coat is from a brand called Darling. As soon as I saw it I was like WOW! Its such a pretty pattern and I think if I was to wear it I would definitely feel a little bit like Kate Middleton or at least feel I should be going to Ascot or something posh! I first came across the brand Darling in a shop in Cheltenham (which is where I go to uni btw folks!) and it is a little bit on the pricey side. However you can always get a good bargain in the asks sale and I've also noticed quite a few of their items in T K Maxx! I love these Steve Madden shoes! 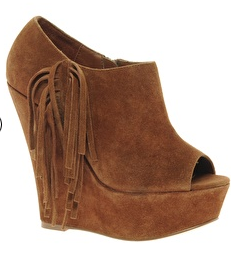 I've been looking for a cute pair of shoe boots like this for ages and definitely found the pair I want! The fringe detail is perfect and right on trend at the moment. And with them being wedges it makes them easier to walk in. Bonus! I'm definitely not great when it comes to handbags. I usually use the same one for about 6 months (or until I trash it) and then buy a new one and never use the old one again! This is a habit I am trying so hard to get out of. I want to build up my handbag collection with lots of new styles and colours and I think this bag definitely fits the bill. 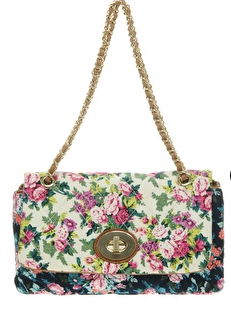 This ALDO bag is beautiful and eye catching and would spruce up any dull outfit. Last but by no means least beauty! My favourite! Theres not an awful lot of make-up in the ASOS sale but I did find some items form a brand I've been meaning to try out. Pixi recently came out with a line inspired by Tinkerbell from Peter Pan. This highlighter, or fairy dust as they call it, is designed to give a glowing, luminous finish to anyones make-up.